Wednesday, October 5th will mark the fourth and final opening celebration of the Hudson Valley Art & Wine “pairing project” and all are welcome to attend!. The event takes place at the Albany Heritage Area Visitors Center at 25 Quackenbush Square (corner of Broadway and Clinton) from 5–7 PM. Parking is available via Spencer Street. RSVP required to accvb@albany.org. Join Hudson Valley Wine Magazine at the Albany Heritage Area Visitors Center to meet several of the artists and for a tasting of select wines from some of the local wineries that inspired their art. Wines from Brookview Station Winery, Hudson-Chatham Winery and Millbrook Vineyards will be available for tasting and sale. Food tastings will be prepared by Classé Catering of Albany and cheese by R & G Cheese of Cohoes. The upcoming exhibit in Albany concludes our year-long celebration of Hudson Valley Art & Wine. Since the exhibit premiered this past May at the Lyndhurst Historic Site in Westchester, it has traveled to several other galleries over the summer. Enthusiastic crowds welcomed the exhibit at M Gallery in Catskill in June and Hudson Valley Gallery in Cornwall-on-Hudson in July. 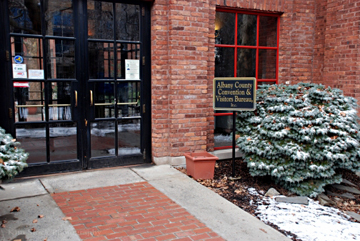 The exhibit will remain at the Albany Visitor’s Center until January 2012. If you are an art and wine enthusiast be sure to stop by and enjoy a beautiful fall evening in Albany. Pick up a complimentary Ravenscroft crystal wine glass and gift bag with the latest issue of Hudson Valley Wine Magazine to take home too! RSVP to accvb@albany.org by October 3 is appreciated. If you are a member of the media, please join us for a Preview beginning at 3PM. This entry was posted in Art, Art and Wine, events and tagged albany heritage area visitors center, albany ny, Artist & Winery Pairing, hudson valley, hudson valley art, hudson valley art and wine, new york art and wine, wine tasting. Bookmark the permalink.